Join us for a celebration of books and libraries hosted by Stanford Libraries and the Hand Bookbinders of California at the American Bookbinder’s Museum in San Francisco. 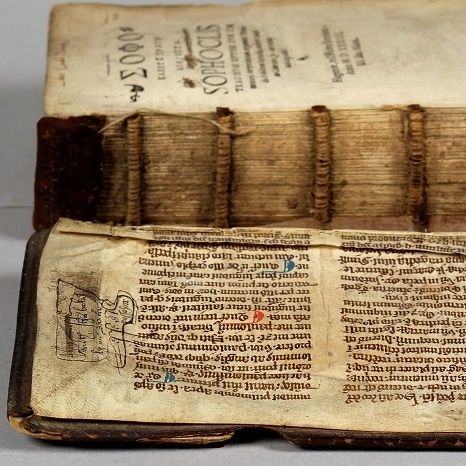 Elizabeth Ryan, book conservator with the Stanford Libraries Conservation Department, will give a presentation on conservation approaches to scholarly significant book damage and previous interventions in research collections. Enjoy light refreshments and drinks while visiting with Bay Area colleagues and visitors, as well as participate in museum and exhibit tours. Image caption: Sophoclis trageodiae septem… [Haguenau, France: Ex officina Seceriana, 1534] (Stanford Libraries Department of Special Collections PA4413 .A2 1534). Photo by Elizabeth Ryan.